CRYSTAL BALL with STAND Haunted House Prop Halloween Decoration Cosplay Gypsy Witch Costume Accessory. 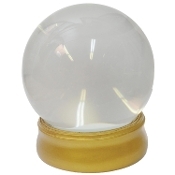 Heavyweight GLASS water-filled globe, authentic looking faux crystal ball, on solid resin golden colored base. Approx. 4.5-inch (11.25cm) high with stand x 4-inch (10cm) diameter glass globe. *Please note: This is a stage and theater costume prop. It is made of solid-filled glass, and not made of actual crystal. Not a real metaphysical product.